What are the future cancer risks for your patients and their families? In the SOLO2 trial, a significant improvement in progression-free survival in patients with germline BRCA-mutated, platinum-sensitive, relapsed ovarian cancer when treated with the PARP inhibitor olaparib. Other studies such as Study 19, ARIEL2 and NOVA demonstrated that a germline BRCA1/2 mutation can be a predictor of increased efficacy with PARP inhibitor therapy. Explore our publications to learn more about how BRCA1/2 testing can impact treatment decisions related to PARP inhibitor therapy and DNA-damaging chemotherapy in ovarian cancer. 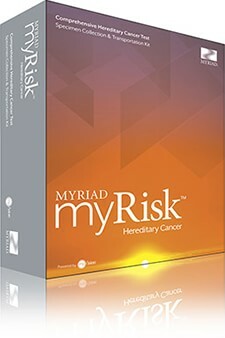 Myriad is the unquestioned industry leader in variant classification and reclassification. myVision® is the most advanced program in the industry overseeing the classification and reclassification of uncertain variants and is part of Myriad’s commitment to patients and their families that lasts a lifetime.